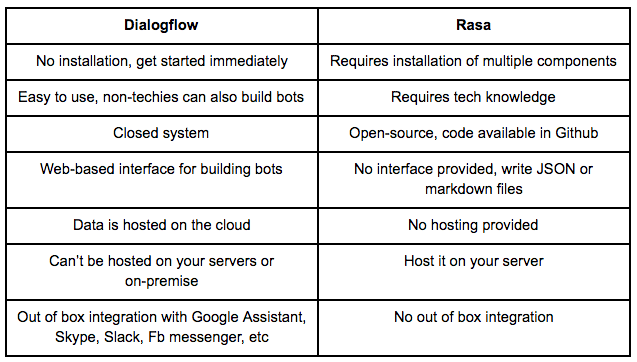 This article covers the differences between Dialogflow and Rasa, and helps you understand which one to choose. First of all, we found Dialogflow to be super easy to use. Almost everything is available in the user interface and you can create a bot without writing even a single line of code. Dialogflow provides everything from Entities, Intent, Training, Analytics, History to Integrations. They are available in the user interface. It is like a full-fledged ready to use service.